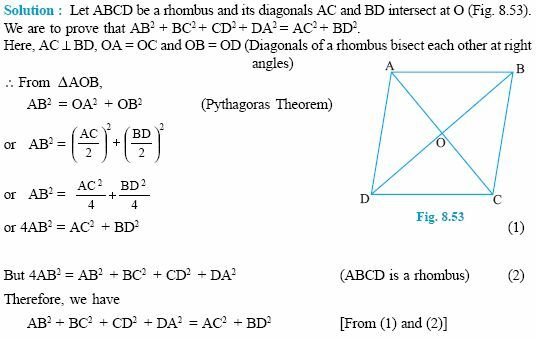 Theorem: In a right angled triangle, the square on the hypotenuse is equal to the sum of the squares of the other two sides. Converse: In a triangle if the square of one side is equal to the squares on the sums of the other two sides, then the angle opposite to the first side is a right angle. Example: Prove that the sum of the squares of the sides of a rhombus is equal to the sum of the squares of the diagonals. 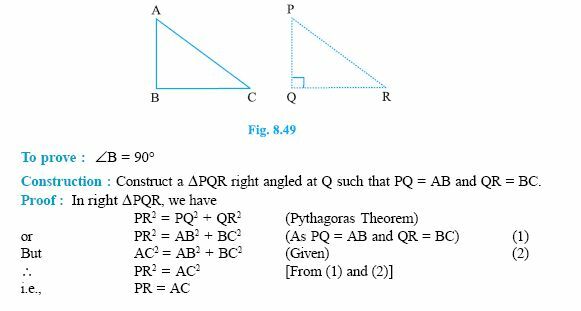 Q 1: Which of these is a Pythagorean triplet? Q 2: Triangle PQR is equilateral. QR = 30 units, B is the midpoint of QA. QA is perpendicular to PR. What is the length of PB? Q 3: The sides of a triangle are 3cm, 8cm, 6cm, check if this is a right angled triangle. Q 4: A ladder 20 m long reaches a height of 16m above the ground. Find the distance from the foot of the ladder to the wall. Q 5: A ladder is placed in such a way such that its distance from the wall to the foot of the ladder is 5 cm, its top reaches a height of 12m from the ground. Find the length of the ladder. Q 6: A ladder 20m long reaches height of 16m above the ground. Find the distance of the foot of the ladder from the wall. Q 7: A person goes 10 m due east and then 30m due north. Find his distance from the starting point. 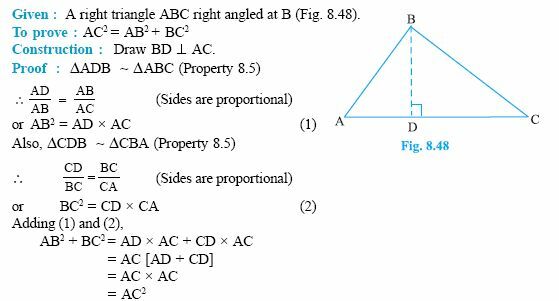 Q 8: The sides of a triangle are 50cm, 80cm, 100cm, check if this is a right angled triangle.